About two months ago, I began my first batch of peppermint extract. Every winter, I enjoy making peppermint marshmallows, peppermint mochas, and other pepperminty things. I also like to make homemade gifts. I figured this would be perfect for stocking my cabinets with pepperminty goodness, and for giving as gifts. Making your own extracts in incredibly easy. For the peppermint extract, I bought a huge bottle of Vodka from Costco (under $20). I then picked peppermint leaves from my front yard. You'll need vodka and peppermint leaves. That's it! Wash leaves, remove stems, and dry them off with a towel. Fill a jar with leaves and vodka. It's important that the vodka fully covers the leaves, or the leaves will get yucky/moldy. I filled my jars about 1/4-1/3 full of leaves. 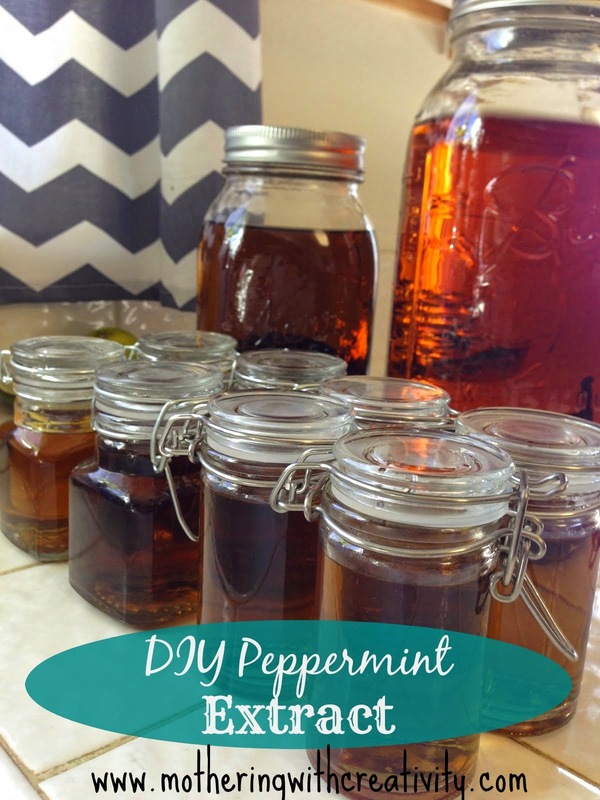 Place an airtight lid on your jar, and place the jar in a dark cabinet. Every week or so, I would give the jar a quick shake. After about 4-6 weeks, the extract should be dark in color (like in my pictures). Strain off the leaves, and pour your extract into small containers (or just leave it in a big one if it's all for you!). Voila! An easy, frugal, and useful Christmas gift. I bought little jars at Hobby Lobby for 50% off, so they were about $1.25 a piece. I'm going to be giving sets of extracts away at Christmas-the peppermint extract, and a vanilla extract, which got started a little later (I used bourbon and vanilla beans for that).